Local government elections were held. The results baffled many a political activist; especially those who were backing the coalition government consisting of the United National Party (UNP) and Sri Lanka Freedom Party (SLFP). The most surprising element of the whole enterprise was the miserable performance of the official SLFP, the political party which had its birth, growth and full fruition during its turbulent journey in the socio-political seas in the country, the political party that was founded by SWRD Bandaranaike as an alternative to the then UNP, the political party that introduced a nationalist shade into the fabric of national conversation, was shattered and reduced into dust and debris. The official SLFP, although was headed by the President of the country who deserted his party and defeated its candidate, which was visibly hijacked by those who introduced a very damaging culture of tolerable-corruption into the body politic of Sri Lanka, looks a doomed and utterly pathetic political entity. The vastly liberal mindset of Bandaranaike (SWRD) has been set aside for narrow populist nationalism and rejection of minority rights and their legitimate grievances. The base of the SLFP has been thoroughly desecrated and debased. Satisfaction of its base, which amounts to an astonishing 32% to 35% of the total population, seems to bear fruit with the increasing escalation of cost of living playing right into the hands of a clever politician who knows how to exploit the meandering and wretched psyche of a trusting voter. The 44%, those who voted for the ‘Pohottuwa’, in the just concluded local government elections, consisted of that 32% – 35% and the usually floating vote which is about 7% – 10% of the electorate. The Rajapaksa-led Sri Lanka Podujana Peramuna (SLPP) has totally swallowed the traditional Sri Lanka Freedom Party and Maithripala Sirisena’s loss of its control seems absolute and final. The electorate has shown unmistakable signs of vulnerability. The populist slant it shows could well be accepted as an alternative to a more rational way of governance. That populist wave, if continues to grow in numbers and strength, could overwhelm all rational thinking and conversation. Populism in its stark and transparent veil is concealing beneath its veneer of welfare fabric a corrosive dynamic of power-dealing, and is attracting more and more followers. If Ranil Wickremasinghe chooses to ignore these propensities, the vote-drain that is taking place in his party, the UNP, would continue to its next logical station- disappearance. Forget about Maithripala Sirisena and his loss of control of the SLFP. The UNP’s destiny should not rest on what the leader of the SLFP says or does. The UNP leader has a political textbook before him. Ranil Wickremesinghe’s own Uncle JR and its succeeding leaders such as R Premadasa have provided that book and it has been proven right over and over again. Hand the running of the Party, specifically the posts of Chairman and Secretary, to non-politicos, thoroughbred professionals. JR did it the moment he became the leader in the wake of the demise of Dudley Senanayake. He made Ananda Tissa de Alwis the Secretary of the Party and the moment Ananda Tissa announced his intent to contest at the general elections which were scheduled for 1977, J R removed him from the post of Secretary of the Party and appointed Daham Wimalasena, a non-politico, to the post. After the election victory in 1977, N G P Panditharatne, a well acclaimed private sector professional, the senior partner of a reputed accountancy firm, was appointed as Chairman of the Party and Daham continued as Secretary. The day-to-day affairs of the party belong in the hands of non-politicos. When such posts are held by politicos, in the present context, Malik Samarawickrama as Chairman and Kabir Hashim as Secretary, abuse of such powers is inevitable and could be damaging in the short, mid and long-run. Ministers hardly have sufficient time to run their Ministries, then how they can manage the Party-affairs is unthinkable. Ranil Wickremesinghe may be feeling a treacherous sense of insecurity, but his personal insecurities need to be subordinated to the major interests of the Party. Whereas J R has left a recipe for success, Ranil seems to be wallowing in a recipe for disaster. Furthermore, the results of the recently held local government elections prove beyond a shadow of doubt that Ranil’s modus operandi has failed. He needs to realize that it is his fatal flaw, and sooner he does it, more beneficial for his party and its future successes. Second issue is centered on another vital factor: the successor to Ranil as leader of the Party. Ranil Wickremesinghe is, to be gentle to him, in a very unenviable position today. He simply cannot evade from the branding of him as a ‘perennial loser’. That ‘perennial loser’ badge belongs to him, not only in the minds of his critics; mostly his own close supporters too believe that notion. He needs to avoid another eruption, as it happened in 2012 to 2014 period, within his own Party, among the UNP parliamentarians for a change in leadership. In such a confrontational context, Ranil has to refer to his Uncle JR again. Just prior to the general elections in 1977, JR summoned all UNP organizers to Sirikotha. He did not give any particular reason for the meeting. However, he instructed Daham Wimalasena, the Party Secretary at the time, to prepare ballot papers. When all the organizers were in, JR stated that he intended to appoint a special committee to direct the affairs of the forthcoming general elections in 1977. He distributed the ballot papers among the participants and asked them to name the first ten UNPers in their preferential order to man this committee. That is how R Premadasa became the virtual successor to J R. Gamini Dissanayake was a close second to Premadasa. (Premadasa received 118 votes while Gamini D got 112). Ranil must follow this example without any delay. 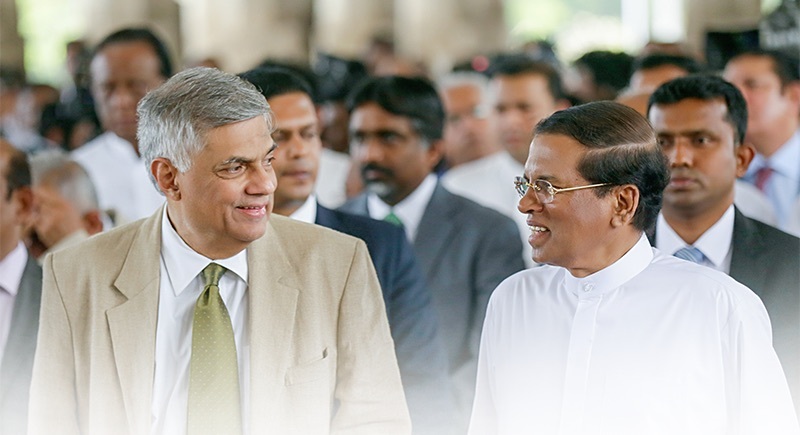 The country needs to know who would succeed him as Party Leader, a winner at the elections, so that the country at large and the party in particular will know whether there is a future for the UNP! The Party will remember who won his electorate and who lost. Thirdly, when one looks at the way the rural folks seem to have left the UNP, it is of utmost significance that Ranil pays close attention to the fact that, ever since the demise of Premadasa, Gamini and Lalith, ever since 1994, the rural population and the so-called déclassé remain divorced from the Party and no conscious effort has been made to get a remarriage working. Over-dependence on the minority vote might help in the context of the Presidential elections where the elections are held on a national level. Parliamentary and other local elections are held in each grassroots area where the prevalence of minority votes is minimal and negligible. The UNP’s performance among Sinhalese-Buddhist vote-bloc is abysmal. The UNP-content of the rural vote seems not to exceed 25%-30%. That is simply not sufficient to win parliamentary elections. Why not institute a separate Ministry for Rural Development with substantial appropriations and hand that Ministry to a young Minister with a set of civil servants who possess an unblemished record and reputation? The alarming genre of the civil service under the Rajapaksas deserves special attention. The culture of corruption and nepotism has swallowed our society head, body and foot. That culture has been embraced by our civil service and the rural folks have come to terms with it. As a result, each and every politician and civil servant has been tarred with the same brush. Honesty and financial integrity have become obsolete and those who are being served by the government servants have accepted granting santosam or bribes as a norm. There is no alternative to this culture other than a radical approach that could be adopted and make the rural men and women shed their fear of politicians by an efficient and honest group of politicians and civil servants. It may well be a tall order to expect our politicians and government servants to hold on to such lofty ideals, but there is no alternative. The only alternative is Rajapaksian culture of corruption. It is utterly futile and meaningless to present another set of corrupt set of politicos as an alternative. The Rajapaksas cannot be outdone in the field of corruption, fear-mongering and authoritarianism. The alternative must seem as a radical substitute; a departure from what was. Is the current UNP capable of confronting and be successful in handling such a heavy and arduous challenge? This is the dual-dilemma confronting the coalition. Maithripala Sirisena has to come to terms with the reality of the SLFP being out of his grip and Ranil Wickremesinghe is facing a draining of votes from the UNP. If neither is ready for a radical change, they are both committing political hara-kiri. They must realize that the way they had been going has not produced favorable results. Leaders who are ready for radical changes have always been successful while those who don’t, have dug their own graves. Ranil and Maithri must choose the former. « Will 2020 – 2030 Be The Golden Era For Sri Lanka?